The theme of Jack Daniel's premium exclusivity and fine blend oozes from every inch of the bike, evident even in the custom built fender. The front wheel is a contrasting cut to the bike body with 19 inches and 10 shiny spokes. A pure silver handcrafted Jack Daniel’s horn cover badge sits ominously on the tank made by Montana Silversmith. The body colour of the bike is Rustic Matt Black inspired by the J.D’s charcoal coloured accents. Floor board also extends the J.D styling with the “Old No.7” billet and floor board. Unlike other bikes, the black painted tank has a classy leather pouch, big enough to carry a smartphone and other important items. To remind the rider that safety always comes first, there is a warning “Bottles and Throttles don’t mix” inscribed onto the bike. Each bike carries a unique build number. All the intake covers and cams covers are one of a kind and all in black. There is a saddle audio system souped up with a 200-W audio-system. This handcrafted masterpiece is set for August 2017 release. Only a single bike will be available in the U.K., at a whopping price of £33,799. 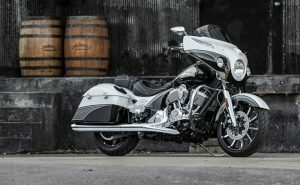 Chieftain will not be a bike with all looks and no performance. Since its makers are none other than the All-American Manufacturers, ride experience will be nothing short of pure exhilaration. The engine design is vintage (because nothing which is classy is anything but vintage) with valve train geometry, cover design and head construction. Powering this class on wheels is a Thunder stroke 111, a trademark of the Chieftain, with 1811cc volume, 73bhp and 160Nm torque belted out of the V-twin engine. The torque itself is enough to blaze you a tarmac. An engine of this power needs cooling which is handled by a combination of air and oil coolers which ensure that the operation is smooth with minimum throbbing. More is said and written about the bike’s styling and exclusivity than its actual performance. Since the bike is a collector’s edition, the key focus is its branding and pride in being among the 150 limited owners. The collaboration between the two exceptional market leaders began in 2016 with the unveiling of the Limited Edition J.D Springfield and Indian Chief Vintage to commemorate Jack Daniel’s 150th anniversary. All the bikes produced were sold within the first eight hours. The Chieftain is sure to steal a number of hearts!